97% of respondents thought their audiences would be interested in learning about the impacts of climate change. According to several analyses of where Australians get their news, in the age of ubiquitous social media TV is still the single largest news source. And when one considers that social media and now apps are increasingly used as the interface for sharing professional content from news organisations – which includes TV news – the reach of TV content is not about to be challenged anytime soon. The combined audience for primetime free-to-air TV in the five capital city markets alone is a weekly average of nearly 3 million viewers. This does not include those using catch-up on portable devices, and those watching the same news within the pay TV audience. And there are those who are getting many of the same news highlights and clips through their Facebook feeds and app-based push media. Yet the ever-more oligopolistic TV industry in Australia is very small. And professional weather presenters are a rather exclusive group: there are only 75 such presenters in Australia. It is because of this, rather than in spite of it, that weather presenters are able to command quite a large following. And they are highly promoted by the networks themselves – on freeway billboards and station advertising. 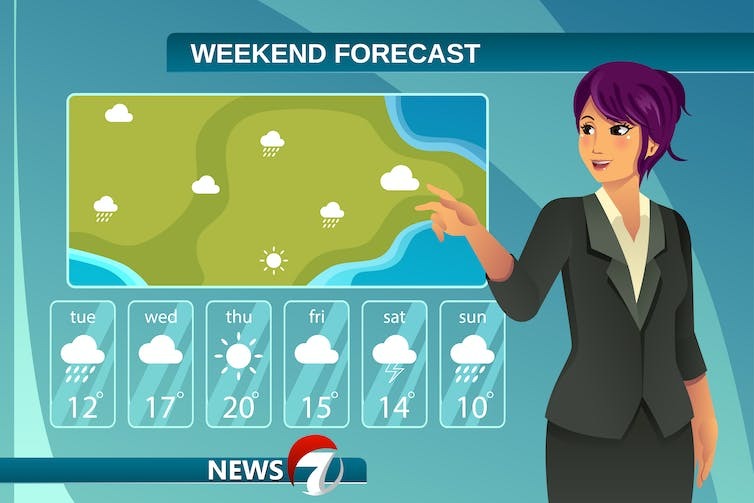 This promotion makes weather presenters among the most trusted media personalities, while simultaneously presenting information that is regarded as apolitical. At the same time, Australians have a keen interest in talking about weather. It tends to unite us. These three factors – trust, the impartial nature of weather, and Australian’s enthusiasm for the weather – puts TV presenters in an ideal position to present climate information. Such has been the experience in the US, where the Centre for Climate Change Communication together with Climate Matters have partnered with more than 350 TV weathercasters to present simple, easy-to-process factual climate information. In the US it is about mainstreaming climate information as factual content delivered by trusted sources. The Climate Matters program found TV audiences value climate information the more locally based it was. Monash’s Climate Change Communication Research Hub is conducting research as a precondition to establishing such a program in Australia. The next step is to survey the audiences of the free-to-air TV markets in the capital city markets to evaluate Australians’ appetite for creating a short climate segment alongside the weather on at least a weekly basis. As in the US, TV audiences are noticing more and more extreme weather and want to understand what is causing it, and what to expect in the future. The Climate Change Communication Research Hub is also involved in creating “climate communications packages” that can be tested with audiences. These are largely based on calendar and anniversary dates, and show long-term trends using these dates as datapoints. The calendar dates could be sporting dates, or how climate can be understood in relation to a collection of years based on a specific date, or the start of a season for fire or cyclones. There has been so much extreme weather in recent years that there are plenty of anniversaries. Let’s take November 21, 2016 – the most severe thunderstorm asthma event ever to impact Melbourne. It saw 8,500 presentations to hospital emergency departments and nine tragic deaths. There is no reason why this event can’t be covered this year in the context of climate as a community service message. As explained in the US program, just a small increase in higher average spring temperatures leads to the production of a higher count of more potent pollen. Also, as more energy is fed into the destructive power of storm systems, the prospect of breaking up pollen and distributing it efficiently throughout population centres is heightened. The need to be better prepared for thunderstorms in spring is thus greater, even for those who have never had asthma before. For its data, the Climate Change Communication Research Hub will be relying on the information from the Bureau of Meteorology and the CSIRO, but will call on the assistance of a wide range of organisations such as the SES, state fire services, and health authorities in conducting its research. In February 2018, the hub will hold a workshop with TV weather presenters as part of the Australian Meteorological and Oceanographic Society conference. At the conference the planning for the project will be introduced, with a pilot to be conducted on one media market to be rolled out to multiple markets in the second year. The program is not intended to raise the level of concern about climate change, but public understanding of it. As survey after survey shows, Australians are already concerned about climate change. But more information is needed about local and regional impacts that will help people make informed choices about mitigation, adaptation and how to plan their lives – beyond tomorrow’s weather.